I am building the shore of the sand sea here in my Kansas City studio with the help of my two interns, Emma Charles and Adam Hoffsette. We had our first work day on Sunday and I am amazed at how much we accomplished together. And as an added bonus for the blog, they are both better about remembering to document what we are doing than I am. The One stands at the shore of the sand sea. We’ve been working hard to get all of this built and tested. Three tables will support five 24″ x 48″ sheets of perforated steel. This perforated steel is great stuff! It will work for both magnet foot anchors and T-nut foot anchors as well as for my crazy wave generator idea. The only down side is the cost. My generous Patreon supporters are helping to cover part of that. Thank you! I ordered the sheets from OnlineMetals.com. Adam working on a table. Emma and Adam working on a table. Laying down the perforated metal sheet with Emma. Photo by Adam. Close up of the perforated metal sheet in place. Photo by Emma. We put spackle on the foam rocks that I had carved and painted the black undercoat. My next step with the rocks is to dry brush grey over that. The rock in the foreground is bare foam and spackle. The rock i the background is almost finished with it’s black undercoat. Emma working on the second rock. Photo by Adam. I purchased 500 lbs of paver sand to use for the sea of sand in May, hoping that it would be dried out by now. That was not the case so Emma spread it out on a cloth in the studio to dry so we can sift out the pebbles. My dog came downstairs to snoop around and decided the sand must be a little bit of outdoors brought inside just for her. She loved it so much she peed on it! I shooed her away quickly and removed the soiled sand. I’ve had a really successful summer working in my Oregon studio, completing two and a half minutes of new animation for Seed in the Sand! The goals with this sequence are to show the excitement and emotional ties of the group and the romantic affection between The One and his Mate as the sprouted seed grows into a tree. So, how do I go about bringing my puppets to life and making them appear to emote in a way that the audience can feel? A snapshot of the creatures on set. Sometimes the greatest emotional impact can be achieved with the smallest of movements like a subtle tilt of the head, or simply a long pause with no movement at all. Many of the shots I have been working on don’t involve very complex movements. The pair may only move slightly as they look at each other fondly. In some ways this can be more complicated than a walk or big movement. The subtle tilt of a head may need to continue for a second or more. At 24 frames per second shot on twos, that makes 12 movements per second. Each frame requires a movement so small that I can only tell I have moved the character by checking it against the previous frame in DragonFrame and if I move the character just a little too much it can be a real challenge to get back to the correct pose. While long shots where the characters are barely moving are a normal part of live action filmmaking, in animation the impulse to keep the puppets in constant motion must be held in check if you want to create an emotive or contemplative scene. This level of restraint took me a long time to learn. Even now it may take a few times watching a shot to see how long the pause really needs to be. If I haven’t made it long enough when shooting I will repeat frames in Adobe Premiere until the pause is long enough but not so long that it feels like a freeze frame. The action can usually be paused for at least a half second before it starts to seem unnatural and sometimes even a second can work. Tiny eyelids made of clay and the tools I use to apply them to the puppets. Well timed blinks add an important element to a character’s reaction to events or suggest that they are considering what is happening at the moment. Also an occasional blink helps them to seem to be alive. Most basic blinks that I animate are four frames long. Now that summer is here again I’ve got a nice, long break from my faculty position at Kansas City Art Institute to make as much progress on Seed and the Sand’s meadow scene as I can manage. This set is still in Oregon at the family farm due to its enormousness and fragility! A few weeks ago I set off for the west coast with dog and child. Our first stop was Los Angeles for a little fun with friends and then up to Oregon to deliver my daughter to summer camp and get to work animating! The first job when we arrived was to reclaim my meadow set from the mice and spiders! The spiders still remain in the margins watching from above, beside and behind. The mice keep out of sight. My puppets needed some maintenance too. I washed their little hands and brushed their messy fur. Gently cleaning with a paste of baking soda and a soft brush. The storyboard cards are pinned up. I don’t always follow the cards precisely, but they help to guide my animation. I get a lot of inspiration as I work. New shots get added, and some get cut or changed. This set of cards tells a story of new life and impending starvation. The first day animating, I managed seven seconds in 6 and a half hours. I hope I can keep up that pace. I’ve got a month here to get as much done as possible. I plan to be finished with this set by the end of next summer. When I get back to Kansas City in the fall I’ll be building a new set and bringing on a couple of interns to help with background animation! I am starting work on the sea monster for Seed in the Sand. At 38 inches long, she is almost four times the size of the nest dwellers. The monster is very dangerous but should look appealingly pretty so as not to cause fear at first sight. The scales and tail fin will match the mermaid from The One’s dreams and the hands will be feminine and pretty. The head has a ball of aluminum foil at its center and is covered with wire mesh in preparation for the sculpey. The dainty hand is the same shape and pattern as the mermaid and masked woman, but with ability to be more fin-like and have more flexibility due to the absence of knuckles. The foot will be very lizard-like but be partially webbed. Notice the T-nut tied into the foot for anchoring. This monster is too large to use the magnets for tie down. The tail fin also has a T-nut tie down. Here is the entire armature rearing up in a threatening posture. Or maybe she just wants a hug. I plan to use some rigging for leaps and stabilization and it will be removed in post. You can see bolts temporarily installed in some of the tie down locations to help me make sure to keep the areas unblocked as I move forward with the flesh and skin. The skull and lower jaw are made with translucent sculpey. The eyes are glass reproductions of fish eyes that I purchased from Van Dykes Taxidermy Supply. Black paint for the gums and inside of the mouth help to define the teeth. The foam is all trimmed. She is ready for skin! I hope you enjoy this demonstration of how I make my puppet hands. If you have any questions, please comment below. This hand belongs to my villain that is under construction and it is about and one and a quarter inches long. I glue that to the wire skeleton starting with the back of the hand and then each finger. Next, using my tiny scissors, I cut the front of the hand out of felt using the hand as a pattern. One of the many good reasons to use hot glue for making the puppet hands is that if a finger wire breaks I can carefully melt the hot glue and peel open the seams to make repairs. I like to use felt because it looks like short fur and I can make the seams disappear. All of the animation for Dream of Dolls Dancing, my short film project made out of the dreams from Seed in the Sand, is complete. I am now adding the subtle touches that give depth to the composited shots by incorporating stock footage from Pond5 into my After Effects compositions. Here are a couple of examples. 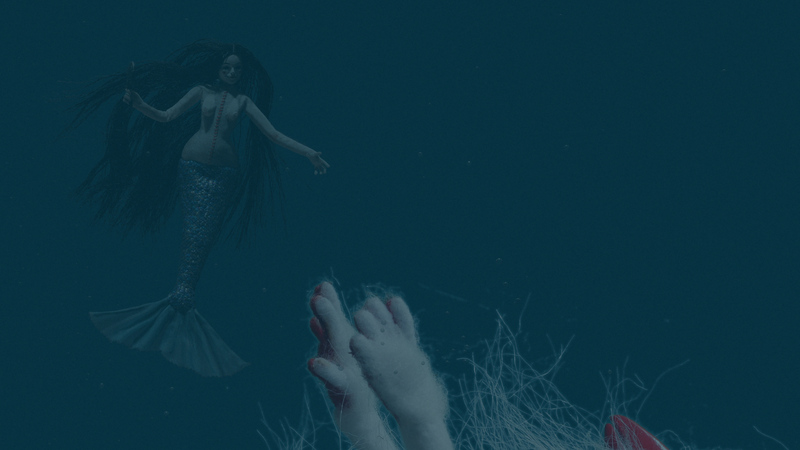 In the shot of The One sinking as the mermaid watches I have added upscaled underwater footage with a camera lens blur effect as a base layer that is obscured with two layers of low opacity blue haze. The first layer is between the mermaid and The One and the other is the topmost layer. The underwater rays of light shift slowly. Soon I will start building the soundscape! 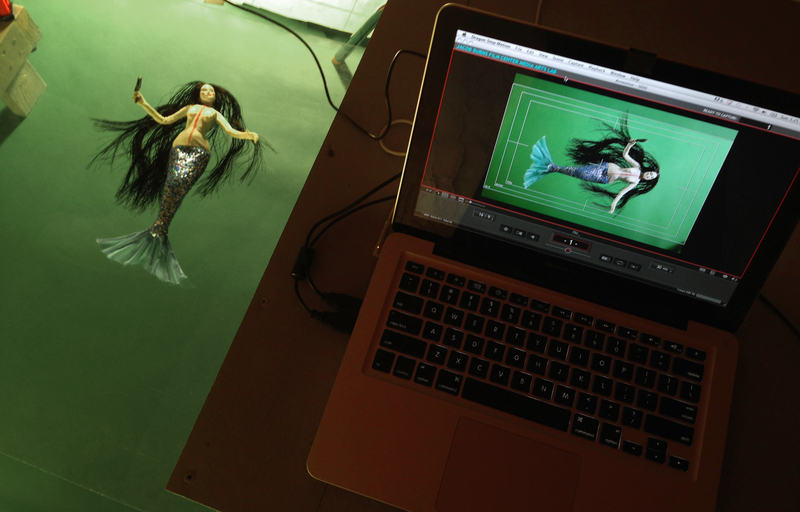 The final shot of the Dream of Dolls Dancing sequence takes place under water. The mermaid is floating and the One is sinking. I shot each character separately over a greenscreen, created bubbles in Cinema 4D, and assembled everything in After Effects. Since I am only doing one shot with a downshooter, I put together a temporary set up with my existing materials instead of constructing something more permanent. The acrylic sheet is clamped to the two animation tables to suspend the puppets above the greenscreen backdrop paper on the floor. To set up the camera for this shot, I removed the central piece of the tripod and attached it to the arm of the c-stand. 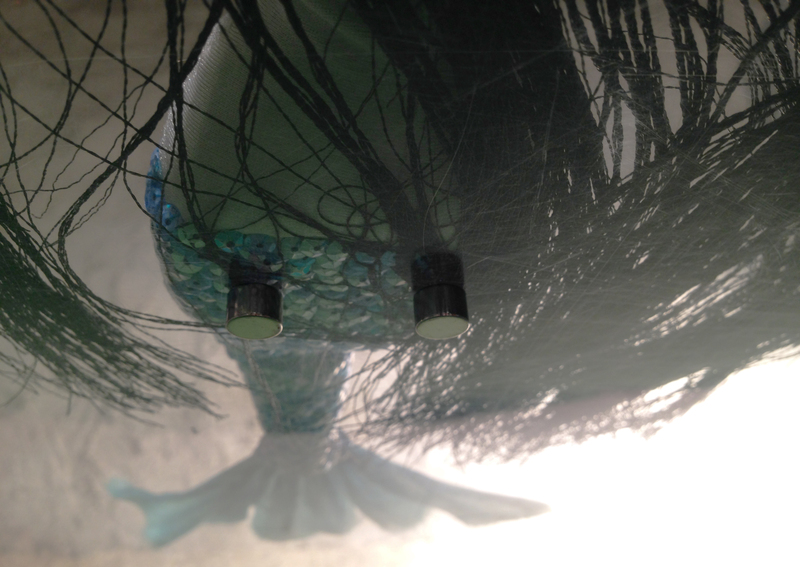 The mermaid has magnets built into her derriere. A second pair of magnets under the acrylic sheet keeps her securely in position. I shot the mermaid sideways so I could get the camera closer to her in order to have as many pixels as possible to work with. Once the two characters were animated I brought them together in my After Effects composition and rendered the partially completed piece as a JPG still image sequence. To create the bubble effect in Cinema 4D, I imported the image sequence for use as a backdrop and constructed an invisible model of the sinking creature to displace the bubbles made by the particle emitter. Then I rendered the C4D bubbles as a transparent PNG sequence and put it together with the other elements in After Effects. A still image of the final result is at the top of this post. 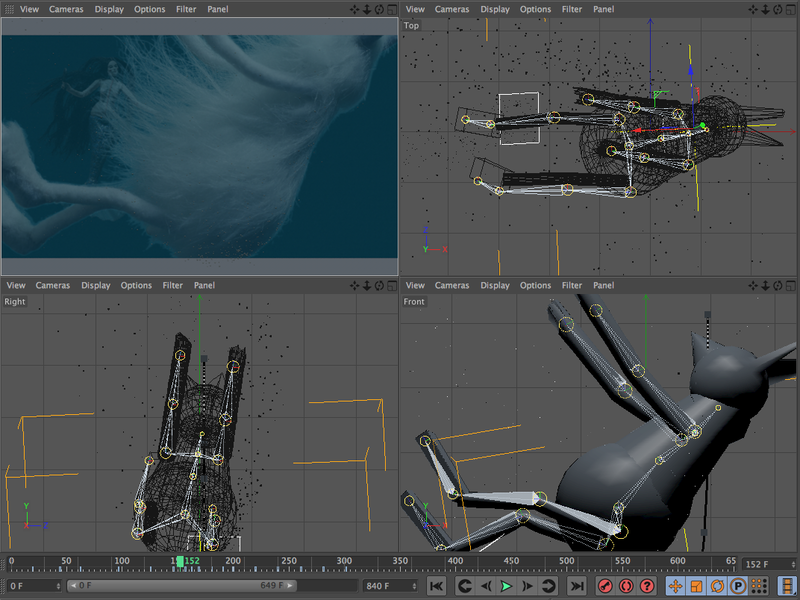 In this screen capture of the Cinema 4D viewport window you can see the rendered frame at the top left. The bubbles and the puppet in the background frame are visible, but the CG character model is not.